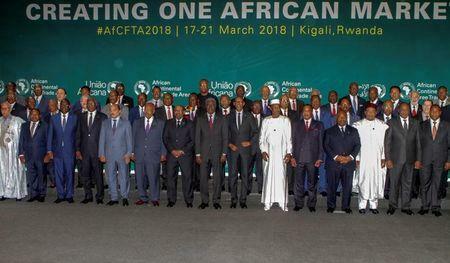 African leaders pose for a group photograph as they meet to sign a free trade deal that would create a liberalized market for goods and services across the continent, in Kigali, Rwanda March 21, 2018. REUTERS/Jean Bizimana NO RESALES. NO ARCHIVES. The African Union started talks in 2015 to establish a 55-nation bloc that would be the biggest in the world by member states, in a bid to increase intra-regional trade, which sits at a measly 15 percent of Africa's total commerce. It was not immediately clear why South Africa and Nigeria stayed on the sidelines. Others staying out of the bloc were Botswana, Lesotho, Namibia, Zambia, Burundi, Eritrea, Benin, Sierra Leone and Guinea Bissau. "What is at stake is the dignity and well-being of Africa's farmers, workers and entrepreneurs," he said. "They are still doing national level consultations and so when they finish they will be able to come on board," he said. Economists point to Africa's low level of intra-regional trade as one of the reasons for the continent's enduring poverty and lack of a strong manufacturing base. "If they just sign the agreement without opening the borders, without getting rid of non-tariff barriers and if they don't work on free movement of people, it is not going to work," analyst Kottoh said. "It is easy and cheaper to buy in Asia than to buy in the sub-region because of less-flexible rules of origin and non-tariff barriers that are not clear," said Meriem Bensalah-Chaqroun, head of the Moroccan Confederation of Businesses. "Some countries all of a sudden decide they are going to do a quality check on goods but they don't really know what they want to check. That slows the trade," said Thomas Schafer, CEO of Volkswagen Africa. "We are not able to bring a vehicle from South Africa into Zimbabwe in a cost-efficient and fast way. That needs to change."